For an adoptive New Yorker, to spend the 9/11 anniversary in Osama bin Laden's hometown felt eerie  doubly so because Riyadh has come to be known as the city of two towers. The Al Faisaliyah and the Kingdom Tower, gleaming glass-and-steel skyscrapers, are less than a decade old, but already they have acquired iconic status: on Arabic TV news, the image of either or both towers is used to signal the viewer that a story's dateline is in Saudi Arabia. 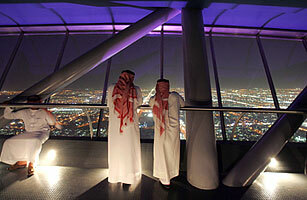 Two nights earlier, while taking in the glittering lights of Riyadh from the viewing deck of Al Faisaliyah, I felt a sudden chill despite the warm desert air when remembering how, on my first visit to New York nearly 14 years ago, I had bundled up against the icy winds swirling around the deck of the World Trade Center's South Tower. I only stayed on the deck of Al Faisaliyah a couple of minutes and didn't dwell on any parallels with the Twin Towers. It seemed unfair to burden Riyadh with the legacy of its most notorious son  especially since the city wants so badly to expurgate him from its self-image. Two Riyadhis I met on Thursday insisted, erroneously, that bin Laden had been born and raised on his construction-magnate father's building sites out in the desert. They were also adamant that, for all his anti-Americanism, the deepest hatred of the al-Qaeda founder is reserved for his own country. They pointed to al-Qaeda attacks on several Saudi targets since 9/11 as proof of bin Laden's murderous intent against his own countrymen. The 9/11 anniversary wasn't big news in Riyadh; Saudis have other things on their minds, this being the holy fasting month of Ramadan. But while counterterrorism experts in the West take this opportunity to bemoan the resurgence of the Taliban and al-Qaeda in Afghanistan and Pakistan, it's worth noting that Saudi Arabia is one of the few places where jihadism is on the wane  with relatively little help from the Bush Administration's "global war on terror." The clearest sign of that success is the freedom with which Riyadhis can travel around their city during Ramadan. Photographer Franco Pagetti, a frequent visitor to Saudi Arabia, recalls that in 2004, there were checkpoints everywhere and a highly visible police and military presence on the streets and in public places. Last night Franco and I drove from one end of the city to another without encountering a single checkpoint. There were no policemen visible amid the crush of midnight shoppers at the suq in the oldest part of the city. As we went up the Al Faisaliyah tower, the security measures were barely noticeable; it's harder to get into my co-op on the Upper East Side. How did the Saudis do it? They used a combination of brute force and subtle persuasion. Few details are available on the crackdown on terrorist groups because the authorities here don't much like talking about it. So it's a fair guess that many of the means they used wouldn't pass any Western human-rights test. Riyadhis speak in whispers about midnight raids, arrests, torture and summary executions. The government also put the squeeze on al-Qaeda's sources of funding by imposing rules on previously unmonitored religious charities. In private, officials boast that bin Laden's organization receives no money from his homeland. In public, the government of King Abdullah prefers to talk about its efforts to reason with extremist preachers and rehabilitate young men led astray by "deviant" ideologies. And Abdullah launched a massive TV, newspaper and advertising campaign to counter al-Qaeda propaganda; for a time, you couldn't draw money from an ATM without reading warnings against extremism! The Saudis also benefited from the overall decline in bin Laden's prestige across the Arab world. Opinion polls in the region show that al-Qaeda's brand of jihad has lost much of its appeal, especially after suicide bombers began to target Muslims  most horrendously in Iraq but also in Afghanistan, Pakistan, Morocco, Algeria and, of course, Saudi Arabia. Saudi officials concede that the fight is far from over. There's evidence that some young Saudis are still traveling abroad to fight the "holy war" on foreign soil. U.S. military and Iraqi officials say Saudi jihadis underpin al-Qaeda's Iraqi operation  although there, too, their numbers have dwindled. Nor has extremism been entirely exorcised from Saudi soil. The top story in the Saudi Gazette on 9/11 announced the arrest of three Saudis and two foreigners for "spreading false propaganda through the Internet." An unnamed official at the Ministry of the Interior says the propaganda sought to lure Saudis into schemes with "vicious and wicked goals." The story is short on details, but it seems clear that the arrested men were trying to recruit jihadis.